Play N’ Go made the Gemix casino slot machine in the likeness of an arcade game. 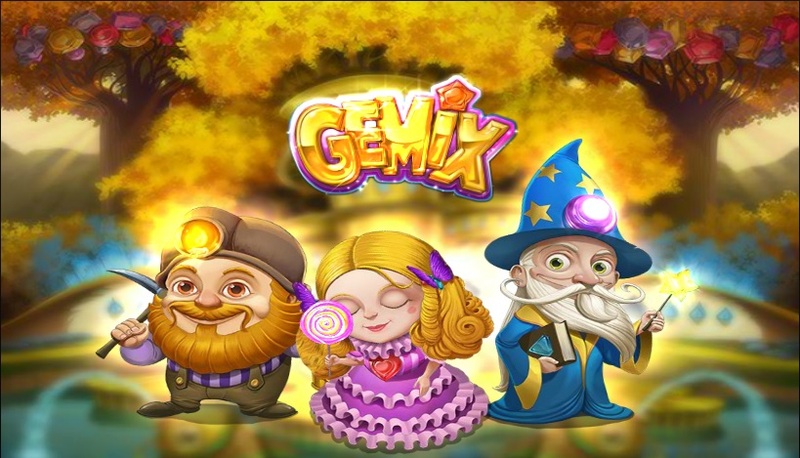 Players who love the arcade themes in online slot machines will love Gemix. The game is presented as a vibrantly coloured 7 by 7 grid. 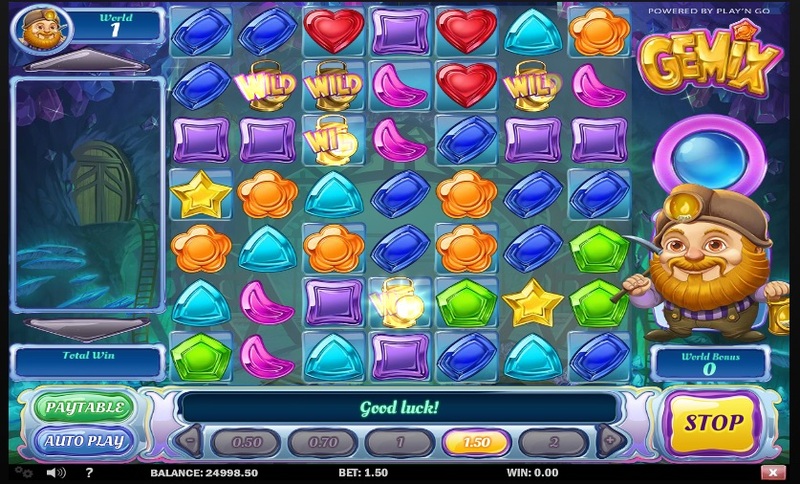 Gameplay is organized in an arrangement like smart phone games such as Candy Crush. Gemix is a one slot game machine that can be played on Android, iPhone, Windows, and Mac. The game has an RTP of 96.75 percent. For players who love the thrill of an unpredictable play, Gemix’s makers added an auto play feature. Play N’ Go made this unusual slot machine game specifically to attract online players who would like to feel like they are in a traditional casino. In Gemix the aim for a player is to have 5 or more same-coloured gems align. The simplicity of the game play makes it highly addictive. Players can stake any amount between 0.50 and 100 pounds. Gemix has 7 reels and a jackpot of 500. In Gemix there are three progression levels. The levels are contained in three worlds, such that the player moves through those worlds on three different levels. 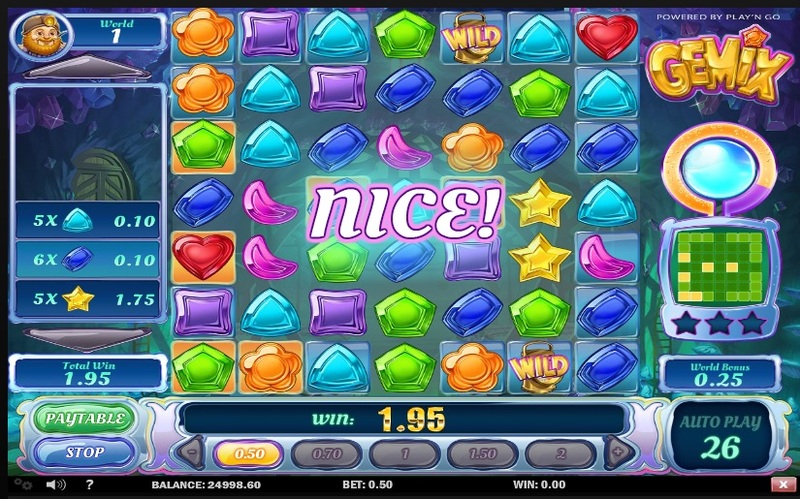 Each level is complete when the player has matched gems on top of each pattern. For leveling up, players earn a world bonus. 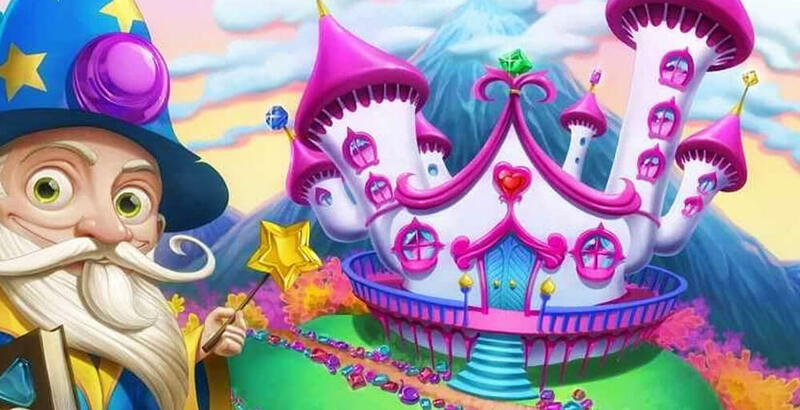 The trick, however, is to ensure that leveling up is not quick, since the size of the bonus decreases with increase in time taken to level up. For each of the three worlds there is a corresponding wild. Wilds are triggered randomly, but only if the player is on a non-winning spin. In the first world, there will be up to 10 wilds in the form of miners’ lamps added to the game’s grid. In the second world, the wild is presented in the form of a lollypop. The wild spreads all over the player’s screen. In world three the wilds are in the form of spell books, of which there are eight. Wilds in the third world remain in the game until the player cannot make the gems match anymore. Maintaining wilds in the third world is not easy, we must say. Gemix features other bonus features, which are accessible when a player gets 20 or more gems in a single spin. The four bonus features are the Crystal Warp, the Nova Blast, the Chain Lighting and the Light Beam. The Crystal Warp bonus is realized when a chosen random symbol causes all matching symbols to change. The Nova Blast explodes, destroying all symbols close to it. The Light Beam changes the symbols it shines through into matching symbols, while the Chain Lighting connects two corners and then changes all symbols in the path of the connection. These features appear on the right-hand side of the playing grid. Overall, Gemix is an engaging game. It is simple and easy to understand, but winning requires patience. The most important part, however, is that the game is fun.